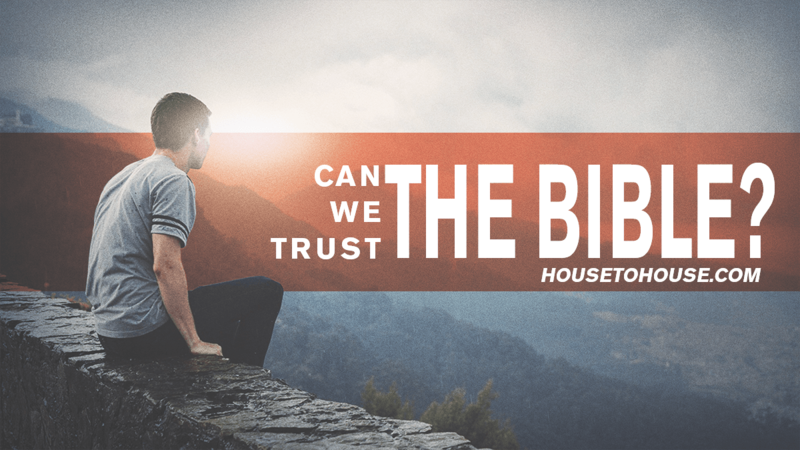 Home Bible Study Can We Trust the Bible? During the 1900 years since the Bible was completed, the original books (autographs) have all been lost and will likely never be found. Thankfully, before they were lost, they were copied. Through the centuries, copies of copies of copies were made. Most of these, too, were eventually lost, but many have been discovered in modern times. Further, the last book of the Bible was written 1,300 years before the invention of the printing press. In those centuries, several of the world’s great libraries—Alexandria, Constantinople, Rome—burned, and hordes of barbarians swept through the lands where copies of Scripture were kept, pillaging and destroying. Can we, then, still trust today’s Bible? How do we know that neither corruption (accidental mistakes) nor collusion (intentional changes) took place? Did transmission destroy inspiration? Here are four reasons to trust the Bible. Almighty God safeguarded the bible. His pledge. The eternal God promised His Word would “endure forever” (Matthew 24:35; 1 Peter 1:23–25). He never breaks a promise (Titus 1:2; Hebrews 6:18). His goodness. God’s character is connected to His enduring truth: “The Lord is good; his mercy is everlasting; and his truth endureth to all generations” (Psalm 100:5). If we can trust God’s wisdom to provide Scripture (2 Timothy 3:16–17), then we can trust God’s omnipotence to safeguard it (Genesis 18:14). His justice. Since God is just (Revelation 15:3), it follows that once God gave His Word to one generation, it had to remain for all generations. He would not condemn man for not keeping His statutes if no one had them (John 12:48; Acts 10:34–35). Careful scribes transmitted the Bible. The Old Testament was written from 1400-400 bc, and writing materials (animal skins, papyri) do not normally last that long. Invaders looted and destroyed the temple and synagogues where copies were housed. Jerusalem was conquered forty-seven times between 1800 bc and ad 1948. Scribes buried worn and flawed manuscripts, as citizens today do tattered flags. Scholars believe that scribes destroyed previous manuscripts when they standardized the Old Testament (put in vowels) in the fifth century AD. New Testament verification relies on comparing thousands of manuscripts; Old Testament verification rests on learning the scribes’ methods. For more than 1,500 years, Hebrew prophets received (Hebrews 1:1), and scribes passed down, Scripture from one generation to the next. Jewish scribes meticulously preserved the law as a matter of conscience. They believed a curse came to those who added to or diminished from God’s word (Deuteronomy 4:2; Proverbs 30:6). Among their rules: an authentic copy must be the exemplar, from which the transcriber ought not deviate in the least; and no word, letter, or even a yod (punctuation) could be written from memory. The scribe must always look at the codex before him (Geisler). Since Jesus endorsed the Jewish Bible in His day (John 5:39), we know it was accurate. Although He accused the Jews of many sins, He never said they had corrupted the sacred scrolls. The question then becomes: Does our Old Testament match the one in Jesus’ day? The modern Old Testament is based on two “Massoretic Texts” (copied by Jewish Massorete scribes in ad 925 and 1009). Massoretes set the standard for exactness. They literally numbered the paragraphs, words, syllables, and letters of every Old Testament book. While other copyists were allowed up to three errors in a book, Massoretes were not. If the middle word and letter of a page did not come out right, they destroyed the copy and made another. These strict requirements, rooted in reverence, created an atmosphere geared to precision. Still, since our Old Testament is based on a copy more than 1000 years removed from the source, critics doubted its accuracy. That changed in 1947 with the discovery of the Dead Sea Scrolls. In March of that year, an Arab shepherd looking for a lost lamb tossed a rock into a hole in a cliff. Hearing something break, he investigated, and what he found—jars with leather scrolls unopened for 1900 years—soon gained the world’s attention. More than a half century later, people still talk about it, for in these jars were the oldest surviving texts of the Old Testament. Between 145 bc and ad 68, a Jewish splinter group inhabited the area. When Romans invaded in ad 68, this group hid their scrolls in caves. In that dry climate, they survived the centuries. Hundreds of manuscripts were gradually unearthed from eleven caves, eventually providing copies of every Old Testament book except Esther. The Dead Sea Scrolls allowed scholars to see a copy of the Bible a millennia older than any modern person had ever seen. How accurately did Hebrew scribes pass down Scripture for 1000 years? The modern Old Testament proved to be amazingly accurate. Aside from a few spelling differences and word order variations, it read the same. Painstaking researchers verified the Bible. The New Testament was written from about ad 40 to 96. By the end of the first century, all twenty-seven books had been sorted (Luke 1:1–4; 1 Thessalonians 2:13), shared (1 Thessalonians 5:27), circulated (Colossians 4:16), collected (2 Peter 3:15–16), and quoted (1 Timothy 5:18) (Geisler). While the original documents were God-breathed and without error (2 Timothy 3:16–17; John 17:17), the Bible nowhere says copies would be inspired. As meticulous as church members were at replicating Scripture, minor differences inevitably occurred. Of the thousands of manuscripts, no two were identical until the printing press. At the same time, they were incredibly similar. Relevant questions to ask in verifying any ancient book include: Where was it found? If a Greek manuscript is unearthed in South Dakota, it would raise eyebrows. If in ancient Alexandria, then not so much. How many copies do we possess? The more copies to compare, the more likely it is that scholars will spot errors. How old is it? Generally speaking, older is better, for it is closer to the source. Their diverse location. Manuscripts come from so many places—Egypt, Palestine, Syria, Turkey, Greece, Italy—that collusion is impossible. No one church ever possessed all of them. Their vast number. Scholars have 5,839 large, 13,000 partial (e.g., Ephesians or part of Matthew) and 60 complete manuscripts. Their early date. Papyri fragments date to within twenty-five years of the completion of the New Testament. The earliest is John Ryland’s (P52) fragment of five verses from John 18. It dates to ad 120. The earliest large manuscript (Bodmer Papyri with Luke, John, 1 Peter, 2 Peter, and Jude) dates to about ad 200. Nearly complete manuscripts—Chester Beaty Papyri (ad 250), Vaticanus Manuscript (ad 325–350), Codex Sinaiticus, and Codex Alexandrinus—are all within 400 years.Inaccuracies are unlikely to creep in during such a short time period. Sir Frederick Kenyon wrote that the interval between the original composition and the earliest evidence is so small as to be “negligible, and the last foundation for any doubt that the Scriptures have come down to us substantially as they were written now has been removed” (Wikipedia). Their consistency. The science of studying variants is “textual criticism.” Each variation of a verse is painstakingly compared with others. Suppose a second-grade teacher received a letter from a U.S. president. She asked her students to copy it in their notebooks as she read it aloud. Imagine that later the original letter burned in a house fire. Remembering that the students’ notebooks contained copies, she decided to recreate it. Laying those pages side by side, she discovers that one student misspelled several words, another repeated a word, one misunderstood a phrase, and one never finished it. Yet with twenty-five copies she could accurately reconstruct the original. This is a simple way to understand textual criticism. If ninety-five percent of copies of a verse read one way, and five percent read differently, for instance, scholars are confident about what is correct. Textual variations involve only about 1/1000th part of the entire text (Jackson) and mistakes are generally minor, easily spotted, and make no appreciable difference in meaning. The vast majority are misspellings, word order, differences in phraseology, word repetition, and single word omission due to a copyist moving his eyes from one line to the next. Discrepancies are equivalent to spelling differences like S-a-v-i-o-r or S-a-v-i-o-u-r.
Bruce Metzger (1914–2007), a Princeton University scholar of Greek, New Testament, and Old Testament, observed that after 2000 years of copying, only 40 of 20,000 lines in the New Testament are debatable. None affect doctrinal understandings (Anders). Philip Schaff estimated that of 150,000 variations, only 400 affected the sense; and of those only 50 were of significance; and of these not one affected an article of faith. No fundamental doctrine rests on a disputed reading. Ancient Christians Quoted the Bible. The Bible’s friends and enemies frequently quoted Scripture. While the New Testament has only 7,957 verses, early Christians quoted it 36,289 times in sermons, commentaries, debates, books, and letters that still remain. For example, Irenaeus (c. ad 170) quoted it 1800 times, citing 23 of 27 books, omitting only Philemon, James, 2 Peter, and 3 John.
. . . roused my curiosity, and as I possessed all the existing works of the Fathers of the second and third centuries, I commenced to search, and up to this time I have found the entire New Testament, except eleven verses (Geisler). Any one of these four evidences is sufficient to confirm the Bible’s authenticity, but put together, the proof is overwhelming. Anyone who argues that today’s Bible differs from the original confesses either his ignorance of the history of the Bible and the science of textual criticism or his bias against it. Bernard Ramm wrote, “A thousand times over the centuries the death knell of the Bible has been sounded, the funeral procession formed, the flowers ordered, the inscription placed on the tomb stone and the eulogy written, but somehow the corpse never stays put” (Wikipedia). We can trust the Bible. Anders, Max. The Bible. Embracing God’s Truth. Thomas Nelson, 1995. Geisler, Norman L. A General Introduction to the Bible. 1968. Jackson, Wayne, citing Gregory, C. R. (1907), Canon and Text of the New Testament (New York: Scribners). Wikipedia: The Free Encyclopedia. Wikimedia Foundation, Inc. 12 November 15. Did the Disciples Make up the Gospel?